With increasing concern about the purity of our drinking water, more and more people are using water filters to ensure their family’s water is safe. Our team thoroughly researched different types of water filters to help you choose the best one for your needs. We looked at faucet, under sink, reverse osmosis, countertop, and pitcher water filters, as well as the best overall and the best value. Each water filter in our list includes its top features, specifications and other considerations. Be sure to check out our buying guide below to learn more about water filters, including what contaminants are removed, size/space required, water capacity, filters, and cost. Read more about our methodology. With the APEC ROES-50 Reverse Osmosis Water Filter’s five-stage filter system that removes 99% of contaminants, including lead, heavy metals, bacteria, hormones and pharmaceuticals, it’s clear to see why this is a number one Amazon bestseller. The Woder 10K Ultra High Capacity Water Filtration System has many features you’ll find in higher-priced under-sink water filters. 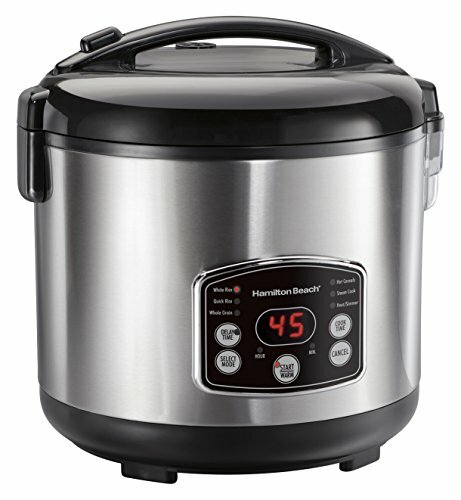 Capable of removing 99.9% of many contaminants including lead, chlorine, and VOCs (Volatile Organic Compounds), the Woder 10K is a great choice for the budget-minded shopper. The Culligan FM-25 Faucet Mount Filter with its quick installation and low cost is an excellent way to make sure your water is clean and safe while removing bad taste and odor and reducing such contaminants as lead, chlorine, and atrazine. 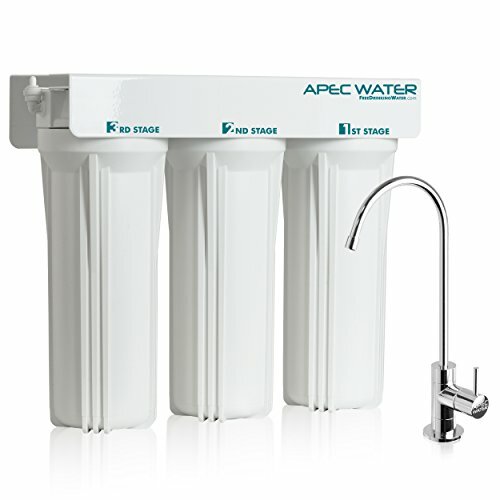 The APEC WFS-1000 3 Stage Under-Sink Water Filter System is a great choice for ensuring your water is free of chemicals, bad tastes, and odors. Unlike many water filters, the WFS-1000 works with well water as well as tap water. 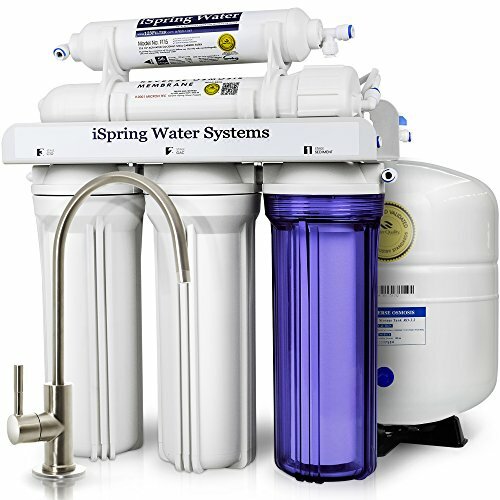 The iSpring RCC7 WQA 5-Stage Reverse Osmosis Water Filter System, an Amazon number one bestseller and WQA (Water Quality Association) Gold Seal Certified, is an excellent water filter that removes over 1,000 contaminants from your water. The CleanWater4Less Countertop Water Filtration System is a simple and inexpensive way to remove contaminants from your drinking water. There are no filters to deal with, the installation is a breeze and you’ll get 10,000 gallons of clean, safe water. The Brita Everyday Water Pitcher is a quick and inexpensive way to get cleaner, better tasting water from your tap. The pitcher comes with one filter, which only needs to be changed every 40 gallons or approximately every two months. Water filters can vary on what contaminants they remove from your water, so you should determine what chemicals, metals, and other impurities are in your city’s water supply. Many towns will have a lab where you can take a water sample for testing, or you may be able to send a sample to a lab outside your area. Home test kits are also available for purchase and vary in price and what contaminants they test for. You should also consider the size of the water filter system and the space required for it. Under-sink water filters can take up a lot of space inside your cabinet, but then the system is hidden and not cluttering your countertop. However, if you have limited space under your sink, a faucet, countertop or pitcher water filter is a great option. 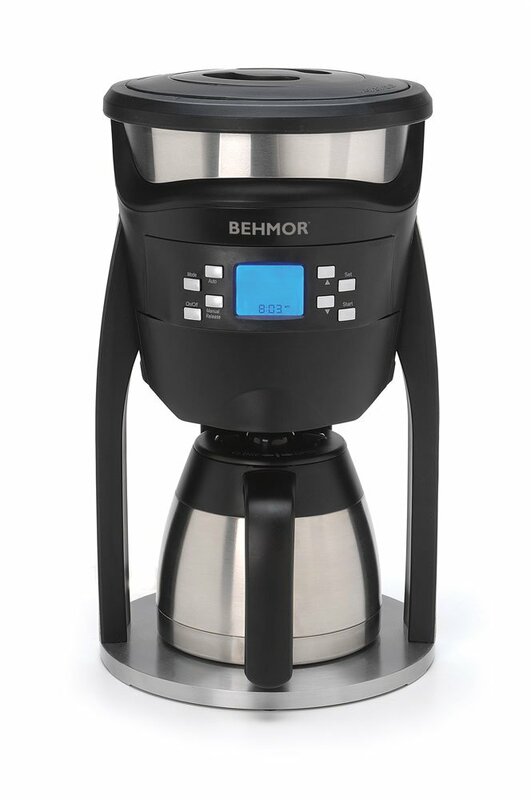 Since a water filter pitcher is a stand-alone unit, it takes up very little space and is portable. Before choosing your water filter, you should determine the amount of water you typically consume. If you use filtered water for cooking, be sure to include that amount as well. Faucet water filters and under-sink filters are only limited by how many gallons are purified before the filter needs to be changed. Countertop filters can hold up to four gallons of water, and pitcher water filters typically hold five to ten cups. Filters are an ongoing expense to using a water filter, so you should look at how often filters need to be replaced and their cost. You should consider the amount of time and effort required to install the water filter, whether it’s DIY or if you need to hire a professional. Faucet and pitcher water filters are your least expensive option, typically selling for $15 to $35. Countertop models are moderately priced between $50 and $200, depending on the water capacity as well as the type of contaminants the filter removes. You can find under-sink water filters for as low as $35; however, models in the $120 to $250 range will remove many more contaminants from your water with either three to six-stage systems where finer and finer impurities are removed with each stage. The price of a reverse osmosis system varies depending on whether it’s part of a countertop or under-sink water filter and the specific features of those categories. The APEC ROES-50 Reverse Osmosis Water Filter is an excellent choice for removing almost all contaminants from your water, even high levels of hormones and pharmaceutical drugs. 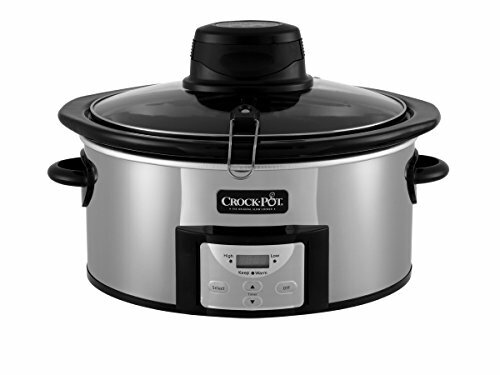 This number one Amazon bestseller is built with quality components and includes easy-to-follow installation instructions. For clean, safe water, the APEC ROES-50 water filter is a clear top pick. Contaminants removed. The APEC ROES-50 water filter system uses a five-stage reverse osmosis process that eliminates up to 99% of contaminants from your water, including arsenic, chlorine, lead, fluoride, heavy metals, bacteria, virus and over 1,000 more. The system will treat tap, well and hard water at a variety of water pressures. Filters. The filters for the APEC ROES-50 last longer than many other models. It’s recommended to change the stage 1, 2 and three filters every 6-12 months and the stage 4 membrane filter and stage 5 polishing filter every two to three years. The FILTER-SET-ES replacement filters are inexpensive and can be bought through Amazon. Water capacity. This reverse osmosis water filter’s capacity is 50 gallons per day at 60 psi and 30 gallons per day at 50psi. The tank capacity is four gallons. Easy installation. 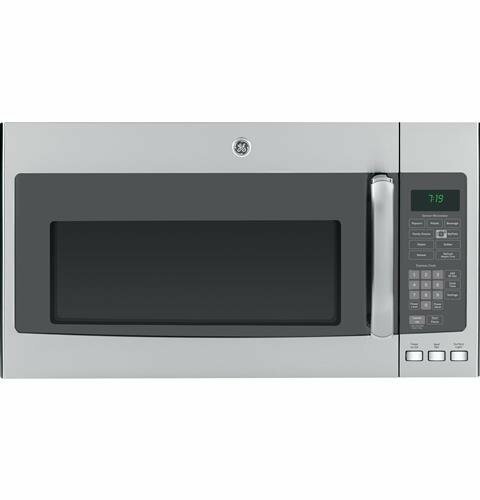 The APEC ROES-50 is designed to fit under a standard kitchen cabinet and is easy to install. Everything you need to install the water filter is included with your purchase: high quality quick connection fittings, stainless steel check valve, clog-free flow restrictor, 5 feet of food grade tubing, one-half inch of input feed water adapters, wrench, tank ball valve, feed water valve, drain saddle, Teflon tape, high quality lead-free faucet and four-gallon pressurized tank, as well as an easy-to-read manual. Size. The complete system—tank and filters—measures approximately 27”wide x 11”deep x 17”high, which some customers found to be too large for under their sink. Though APEC states the system is designed to fit under a standard sink. Removes essential minerals. Though reverse osmosis systems are capable of removing more contaminants than other systems, they can also remove essential minerals. Produces waste water. Reverse osmosis water filter systems produce waste water, and the ROES-50 has a 5:1 ratio of waste water to filtered water. Many areas around the country are learning there are dangerous levels of lead and other contaminants in their water, and the Woder 10K Ultra High Capacity Water Filtration System removes many of these impurities while leaving essential minerals. With its easy installation, compact design and reasonable price, this is an excellent choice to ensure you and your family are drinking clean, safe water. Contaminants removed. 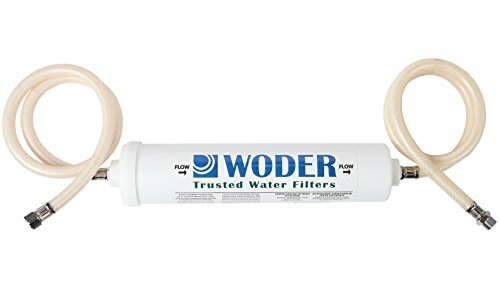 The Woder 10K water filter removes 99.9% of many contaminants, including chlorine, lead and VOCs (Volatile Organic Compounds) as well as mercury, odors, bad tastes, and turbidity—the sediment and particles you may have in your untreated tap water. Easy Installation. This water filter is easy to install under your sink and is delivered as a complete assembled kit, which includes the filter, the head with a built-in valve, an inlet hose—3/8 female compression by 1/4 standard pipe thread and an outlet hose—3/8 male compression by 1/4 standard pipe. It should take approximately ten minutes to install with no plumbing expertise required. Water capacity. The Woder High Capacity system can filter 10,000 gallons of water, which may last up to three years, depending on your water consumption. Size. This water filter measures 12 inches wide x 2.5 inches deep x 2.5 inches tall and is smaller than many other under-sink models. Type of water. This filter should only be used with municipally treated drinking water or water that has been properly disinfected prior to use. Faucet water filters are an inexpensive yet effective way to ensure your drinking water is safe. A faucet water filter eliminates the need for bottled water, saving you money while protecting the environment. These filters are easy to install by attaching them directly to your existing faucet, and some models allow you to easily switch from filtered to regular tap water. You typically have the choice of chrome or white units. Most water faucet filters will significantly reduce the level of chlorine, lead and other contaminants, providing clean, good-tasting water. The Culligan FM-25 Faucet Mount Filter is an inexpensive yet effective way to ensure you and your family are drinking and cooking with clean, safe water. This simple-to-install water filter removes bad tastes and odor from your water while reducing contaminants and turbidity, the sediment and particulates that make water cloudy. Easy installation. The Culligan FM-25 Faucet Mount Filter is very easy to install. It attaches directly to your faucet and requires no tools. In just two or three steps, you’ll be enjoying clean, safe water. Some faucets may require an adapter. A variety of adapters that fit all standard sink nozzles is included with your purchase. Warranty. Culligan offers a two-year warranty, which is longer than most water filter manufacturers’ warranties. Filter replacement. Culligan recommends changing the filter every two months or after 200 gallons of water has been filtered. Some reviewers suggest keeping a filter on hand. An indication that the filter needs to be changed is when the water flow slows. Drop down faucets. Though the FM-25 is designed to fit all standard sink nozzles, it does not fit on drop down faucets. An under-sink water filter is a great choice if you have the space inside your cabinet. These water filters keep your countertop clear and your faucet free of any mechanism. Though more expensive than faucet or countertop water filters, under-sink systems reduce more impurities in your water, targeting a larger number of specific contaminants such as chlorine, lead and mercury, as well as eliminating bad tastes and odors. Filters for under-sink water systems also last longer compared to countertop options. Whether you use tap water or well water, APEC’s WFS-1000 3 Stage Under-Sink Water Filter System is an excellent choice to remove chemicals, bad tastes and odors from your water. The premium filter lasts 12 months, and your purchase includes lifetime support by a certified WQA (Water Quality Association) water specialist. Contaminants removed. 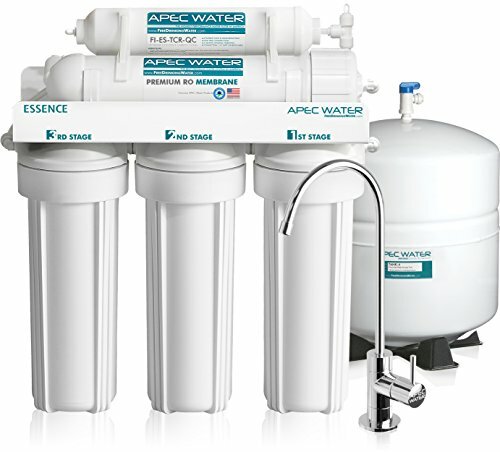 The APEC WFS-1000 water filter removes chemical compounds and sediment with a three-stage process. In stage one, dust, particles, and rust are removed. The second-stage filter removes unpleasant tastes, odors, colors, cloudiness, chlorine and other common chemicals found in water, including VOCs (Volatile Organic Compounds). Stage Three provides additional filtering of contaminants, ensuring clean, safe water is delivered through your faucet. Filters. All filters are of the highest quality materials: the Stage One filter is a 100% pure polypropylene depth filter with excellent dirt-holding capacity compared to many other string-wound or resin-bonded filters. The Stage Two and Stage Three filters are made from premium extruded carbon block. All filters (as well as the entire system) are made in the United States and can last up to 12 months before needing replacement, depending on your water consumption. Easy Installation. The APEC WFS-1000 can stand freely in the cabinet under your kitchen sink, or it can be fastened to the wall using the pre-drilled holes and mounting bracket. Included with your purchase are John Guest quick-connect fittings, five feet of food grade tubing, 1/2” to 3/8” feed water adapters, feed water valve, inserts, Teflon tape, a wrench, manuals and a high-quality lead-free faucet. The filters are also easy to replace; you’ll only need a wrench, which is provided with the system. Does not remove fluoride or lead. The WFS-1000 system is designed to remove chemical compounds and sediment from your water. This system will not remove fluoride or lead. Reverse osmosis water filters are considered one of the best ways to remove over 70 contaminants from your drinking water, including lead, arsenic, nitrates, pesticides, sulfates, bacteria and pharmaceuticals. This is accomplished by pushing water through carbon filters, some models using a multi-stage system, thus capturing the tiniest of particles. Compared to buying bottled water, a reverse osmosis water filter system allows you to enjoy clean, refreshing water for just pennies a gallon, all while helping to reduce the amount of plastic bottles cluttering the environment. For the confidence in knowing your family’s drinking water is clean and safe, the iSpring RCC7 WQA Water Filter System is a smart choice. Using a five-stage reverse osmosis filtering system, the RCC7 removes chlorine, fluoride and over 1,000 other contaminants from your water. Installation is easy, the unit fits in the cabinet under your sink and this product is WQA (Water Quality Association) Gold Seal Certified. Contaminants removed. 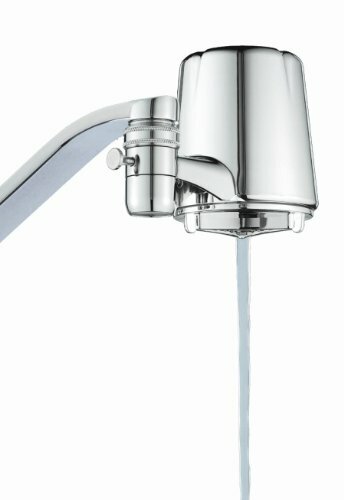 Reverse osmosis water filtering is one of the most thorough methods of removing contaminants from your water, and the iSpring RCC7 water filter removes 98% of chemicals, heavy metals and sediment, including lead, insecticides, virus, bacteria, asbestos, fluoride and over 1,000 more contaminants. Easy Installation. Installation is easy DIY with no plumbing expertise required. Install the filter under your sink with the provided quick-fitting connections and wall-mounting bracket. The tank can be positioned vertically or horizontally. The system comes ready to use and includes a luxury goose-neck faucet and all filters. Type of water. The iSpring RCC7 can be used with regular tap water, water that’s heavily chlorinated water and well water. Waste water. All reverse osmosis water filter systems produce waste water, usually at a 5:1 ratio of waste water to filtered water. The iSpring RCC7 ratio is 3:1, which iSpring claims is the best in the industry. Removes essential minerals. Though reverse osmosis systems are capable of removing more contaminants than other systems, they can remove essential minerals. Produces waste water. Reverse osmosis water filter systems produce waste water, but the iSpring RCC7 ratio of 3:1 waste water to filtered water is lower than the typical ratio of 5:1. Countertop water filters are a great option if you don’t have the necessary space under your sink for a larger water filter system. These water filters consist of a valve that attaches to your faucet. Cold tap water is then routed through a tube to a container that holds the filter cartridge. The water passes through the filter, fills the container, and then you dispense the purified water using the container’s spigot. 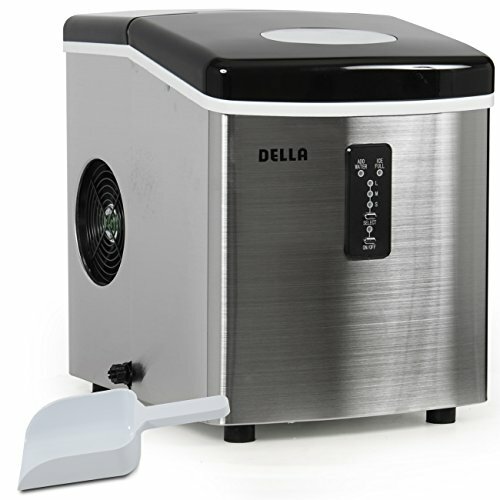 Countertop water filters typically hold up to four gallons water. With no filter cartridges to replace, the CleanWater4Less Countertop Water Filtration System is a simple and effective way to remove contaminants from your water. Besides the initial low cost, with this system, you have no filters to replace, so there’s no added maintenance cost. The unit attaches to your existing faucet and produces approximately 10,000 gallons of clean water. Depending on your water consumption, for an average family of four, the unit will last two to three years. Contaminants removed. The CleanWater4Less countertop system uses granulated activated carbon for its water filter, which removes chlorine, radon, bad tastes and odors, sediment and VOCs (Volatile Organic Compounds). The unit will also significantly reduce heavy metals and low levels of hydrogen sulfide. Easy Installation. You can have this countertop water filter working in minutes with no plumbing required. Simply attach the diverter valve directly to your faucet. If necessary, you can use the included adapters that will fit most standard faucets. You can also find adapters at your local hardware store. No filters required. With the CleanWater4Less countertop filter system, you won’t have the added cost and inconvenience of replacing filters. On average, the unit supplies 10,000 gallons, or two to three years, of filtered water. Lead removal. If you have lead in your water supply, you should note that this unit will significantly reduce, but not completely remove, lead from the water. 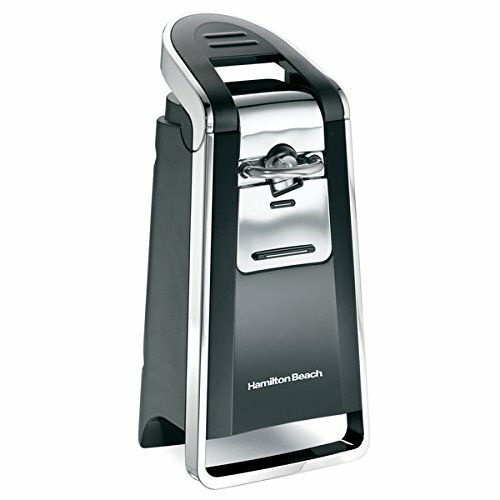 A water filter pitcher is a great way to enjoy clean, great-tasting water without spending a lot of money. A water filter pitcher is portable and easy to use: just add tap water, which will flow through a replaceable carbon filter located under a reservoir in the pitcher. Though these pitchers remove fewer contaminants than other, more expensive water filter systems, depending on the model, they may filter out chlorine, pharmaceuticals, lead and other contaminants. Less expensive than bottled water and better for the environment, the large Brita Everyday Water Pitcher filters 10 cups of water with one easy-to-use filter, included with your purchase. 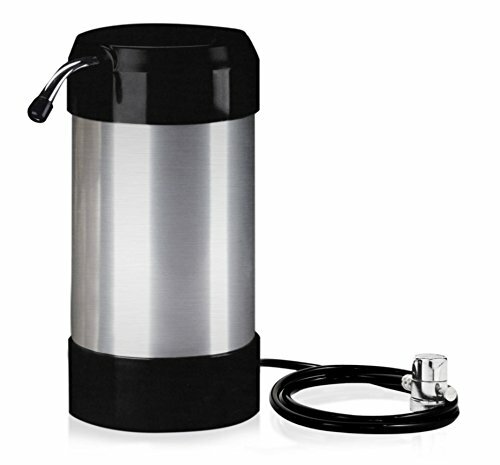 A water filter pitcher is convenient, takes little counter space and you can bring it with you from room to room. The Brita pitcher is a great choice for reducing contaminants and leaving you with clean, refreshing water for drinking and cooking. Contaminants removed. This simple water filter pitcher reduces a good amount of contaminants from your tap water, including chlorine, copper, mercury and cadmium. Unpleasant tastes and odors are also reduced. And the white Brita pitcher is BPA free. Easy-to-use filter. Installing your filter is easy. First, flush it with cold water for 15 seconds. Then insert the filter into the pitcher’s reservoir by lining up the groove in the filter with the notch in the reservoir. Press firmly to ensure a tight seal. The pitcher has an indicator light telling you when to replace the filter, which is typically done every 40 gallons or every two months. Large water capacity. 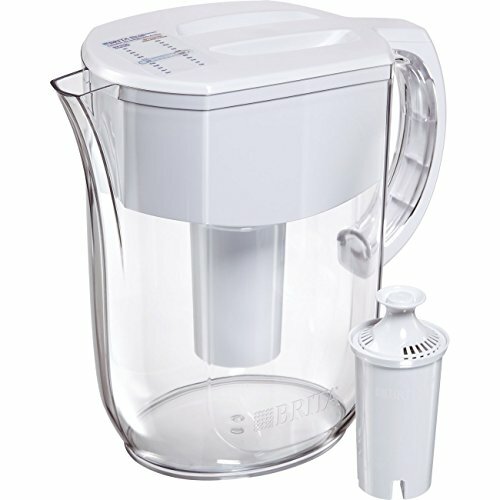 Many water filter pitchers only hold five to eight cups of water compared to the Brita Everyday Water Pitcher, which holds ten cups. Storing. You should store your Brita in a cool, shady place. If you store it in sunlight, algae could grow in the pitcher. You can also store it in your refrigerator. Tip for initial use. Discard your first three pitchers of filtered water, or you can use it to water plants. If you see carbon dust in your first pitcher fillings, don’t worry: this is normal.